Best chocolate cupcake recipe for winter season. 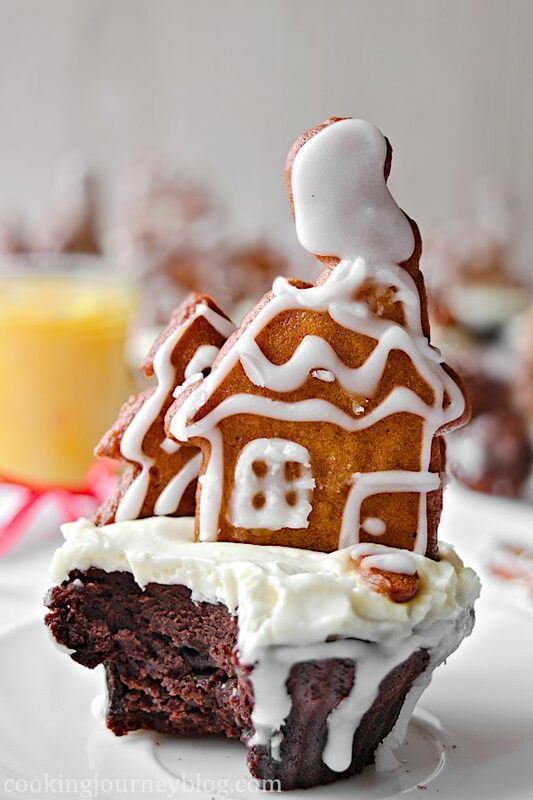 Christmas cupcakes and gingerbread town are the most popular holiday desserts. So why not to combine them together? 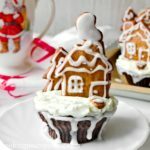 As far as I love building gingerbread houses, I think these Christmas cupcakes are so cute and much easier to make! Christmas gingerbread cupcake will make you smile during the holidays! 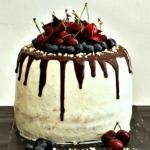 It is a perfect season to make cakes and cupcakes. Chocolate cupcakes are delicious and moist, with vibrant spiced orange filling. Topped with cream cheese frosting and decorated with gingerbread cookies. 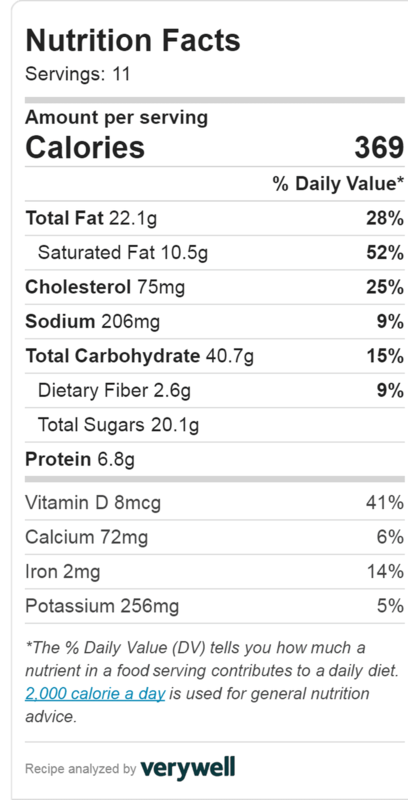 This chocolate cupcake recipe makes 11 servings. So let’s dive into Christmas spirit and I will tell you how to make these delicious gingerbread cupcakes step-by step. 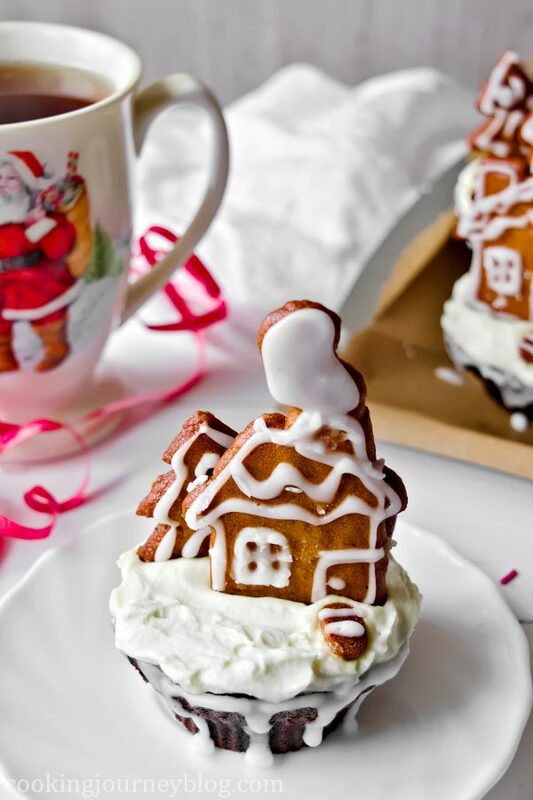 First, make cute little cookie houses, Christmas trees, snowmen (and whatever you want actually). Choose your favorite gingerbread dough. I’m sure you have your recipe, if you make cookies. If you don’t, you can buy a store-bought dough, which will make this recipe easier, ha! Well, that’s what I did and concentrated on the creative part of gingerbread houses. There are a lot of offers of gingerbread dough this time of the year. You can ask your local bakery, buy in your local shop or even online! Just don’t buy the frozen dough, to my mind, it doesn’t work well. So generally, it saves time, as the good homemade gingerbread dough should infuse in the fridge for couple days or a week, and cookies will be always perfect! Roll a small part of gingerbread dough about 1/8″ or 3 mm thick. Use a knife to cut different gingerbread houses (ones with smoking chimney, other without and so on) and Christmas trees. Also cut some small rectangles to make fence and tile road. See the photos to get the idea. 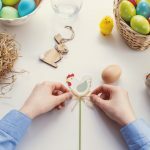 Get creative and get your family and friends to help you! It is a perfect season to get together and make this chocolate cupcake recipe. 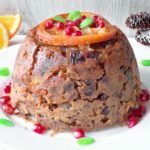 Moreover, our Easy Christmas pudding is great to make with your family, too. If you have small house and tree cookie cutters, you’re lucky! Don’t forget that you should fit one house AND one Christmas tree on the cupcake. So I suggest after cutting one house and one Christmas tree, lift them and try to fit on the cupcake mold to see if it fits. If it doesn’t, it is easy to cut more around the sides of the house and Christmas tree. If you have some more time, you can draw these items on the paper, then cut the stencils and try to fit on cupcakes. If you’re happy with it, use these stencils to cut the dough. Gingerbread cookies are usually baked in oven, preheated to 350 F / 177 C on the baking tray, lined with parchment paper, around 8-10 minutes. Small gingerbread tiles will bake faster, around 5-7 minutes, so make sure to remove them from the tray earlier. I recommend making more gingerbread cookies than you need for cupcakes. First, because you can just eat them, and second, you will need to experiment with decorating them! To decorate gingerbread cookies, I’ve made my own 3-ingredient sugar icing. 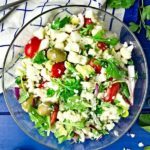 It is so simple and easy to make at home. Just add half a cup of icing sugar or confectioners’ sugar, a pinch of salt and start mixing in half tablespoon of milk until smooth. Adjust by adding more icing sugar or drops of milk until you have perfect icing consistency. It should be pour-able, but very thick. Professional icers (well, I’d better say bakers, but this sounds fun) say that icing should hold it’s shape for 8 seconds. Drizzle a little from the spoon, if it holds its shape for 6-8 seconds before melting back to icing, you’re good. Fill the icing in a pastry bag with metal and try it on the piece of parchment paper. Draw a line and see if it holds the shape. Then make sure your baked cookies are cooled completely, otherwise the heat will melt the icing. Draw the border lines on the cookies and let them dry for at least half an hour. Then start decorating the inside of the cookies. Make dots and garlands on the Christmas trees. Draw roof tiles, snowmen roofs, windows and doors on the houses. Fill the smoke completely white, helping to distribute icing with a toothpick. Draw stripes and tiles on the “road” or tile cookies. If you’re not happy with icing, you should wipe it, when it’s fresh from the cookies with a paper towel. However this is the reason you’ve made more cookies that it was needed, right? You can eat delicious but not perfect cookies, that’s it. After you used designs that you see in these pictures or created your own, let the icing dry completely overnight, or best – 20 hours. You will need to choose your best 11 gingerbread houses, 11 Christmas trees and around 25 road tiles or fences to complete the town for this chocolate cupcake recipe. Now, we won’t buy ready-made cupcakes! These chocolate cupcakes are heavenly good, moist, full of chocolate and have a small orange surprise inside. This recipe makes 11 cupcakes. I bet you’ll use this chocolate cupcake recipe not only for Christmas, but all year long! For this chocolate cupcake recipe you will new unsweetened cocoa powder, all-purpose flour, sugar, eggs, buttermilk, water and vegetable oil. 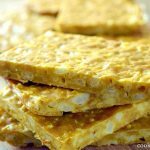 Combine dry and wet ingredients, then incorporate them together. Pour into prepared cupcake or muffin tin and bake until toothpick inserted in the center comes out clean. When your cupcakes cooled completely, cut them to make an even tops. You can use leftover cupcake tops in trifles. For the center orange curd, you will need fresh juice from 2 medium oranges, salted butter, sugar and cornstarch. Yes, this is orange curd without eggs! Heat the juice with sugar and cornstarch, simmer for 10 minutes then sieve in the other bowl. Add in ground cinnamon and ginger. Slowly mix in butter cubes, until melted completely. Cover with plastic wrap or lid and set aside to cool completely. If you love orange recipes you should check our Orange Cake. To fill the cupcakes, prepare a piping bag with decorating tip. Add orange curd in a bag. Insert the tip in the top and center of the cupcake and push it down. Don’t make a hole in the bottom of the cupcake, or the filling will drip off. Squeeze the filling in the cupcake, moving the bag upwards until you reach the top. Smooth the leftover leaking curd on top of cupcake. It will infuse the cupcake! To make a white cream cheese frosting whip heavy cream and in a separate bowl whip cream cheese with a bit of lemon juice. Slowly fold in whipped cream into cream cheese until combined. You can use buttercream frosting instead. Moreover, these cupcakes are so good with chocolate frosting! Just add few teaspoons of sweetened cocoa powder to the frosting, mix, and pipe on the chocolate cakes. This will not represent the snow, but it is so irresistibly good to add more chocolate flavors! 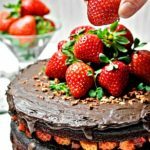 Chocolate cake with chocolate buttercream or chocolate frosting… I will go crazy about it! So to finally decorate our gingerbread cupcake, draw around it drips of melting snow – use leftover icing for that. Then add frosting on top of cooled cupcakes and smooth it with offset spatula or spoon. Leave some snow drifts. 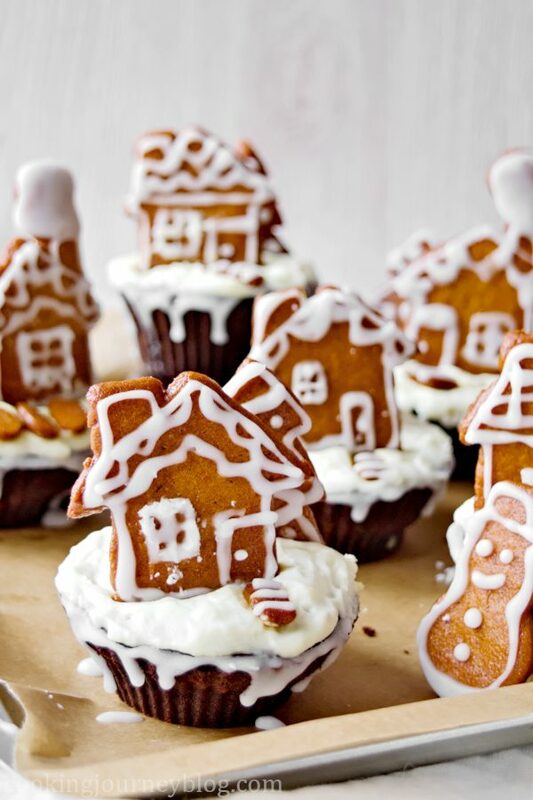 Insert a house and a Christmas tree in every cupcake. Secure them with wooden toothpicks, cut in half. Add the roads and fences and leave them in the fridge. This is my favorite part of chocolate cupcake recipe! Frosting will keep up to 3-4 days in the fridge. You can prepare chocolate cupcake recipe and gingerbread cookies ahead of time. Keep filled cupcakes in the fridge in a tray, covered with plastic wrap for up to 2 weeks. Gingerbread cookies can last art room temperature up to a month. Just make a frosting and decorate cupcakes the same right before Christmas. 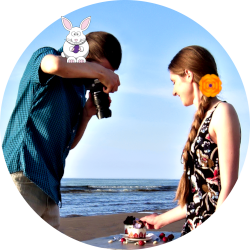 Hope you will enjoy a perfect chocolate cupcake! 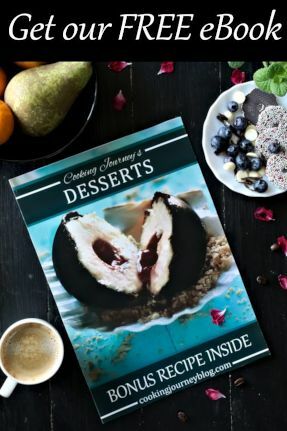 Are you a fan of chocolate desserts? 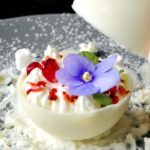 Check our White Chocolate Snowball and Easy Chocolate Cake. 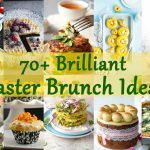 By the way, we have a compilation of 70+ amazing Christmas desserts from different food bloggers that you need to check out. And if you haven’t decided on your main menu, check 50+ Christmas dinner ideas. Have fun, meet with your friends and family, enjoy the cupcakes and have a very merry Christmas! Christmas cupcakes and gingerbread town are the most popular holiday desserts. So why not to combine them together? Preheated oven to 350 F / 177 C.
Prepare baking tray, lined with parchment paper. Put your gingerbread cookies on the tray, leaving some space between the cookies. Bake around 8-10 minutes. Small gingerbread tiles will bake faster, around 5-6 minutes, so make sure to remove them from the tray earlier. Add half a cup of icing sugar, a pinch of salt and start mixing in half tablespoon of milk until smooth. Adjust by adding more icing sugar or drops of milk until you have perfect icing consistency. It should be pour-able, but very thick. Drizzle a little from the spoon, if it holds its shape for 6-8 seconds before melting back to icing, it is ready. Fill the icing in a pastry bag with metal tip and try it on the piece of parchment paper. Draw a line and see if it holds the shape. Draw the border lines on the cookies and let them dry for at least half an hour. Then start decorating the inside of the cookies. Make dots and garlands on the Christmas trees. Draw roof tiles, snowmen roofs, windows and doors on the houses. Fill the smoke completely white, helping to distribute icing with a toothpick. Draw stripes and tiles on the “road” cookies. Let the icing dry completely overnight, or best – 20 hours. 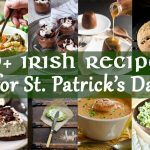 Mix all dry ingredients in one bowl and whisk all other in another bowl. Make a well in the center of mixed dry ingredients and slowly add half of wet ingredients. Combine until incorporated, then add leftover liquid ingredients and combine until you have no lumps. Prepare cupcake or muffin tray with cupcake liners. Fill until the top with batter. Bake about 30 minutes or until inserted wooden toothpick comes out clean. Cool cupcakes completely before filling and frosting them. Squeeze fresh orange juice from oranges in a small pot. Put it on the low heat. Add sugar and cornstarch, mix. Simmer for 10 minutes, then remove from heat and sieve in the other bowl. Mix in ground cinnamon and ginger. Add butter cubes one by one, mixing until melted completely. Cover with plastic wrap or lid and let it cool completely. To fill the cupcakes, prepare a piping bag with decorating tip. Add orange curd in a bag. Insert the tip in the top and center of the cupcake and push it down. Don’t make a hole in the bottom of the cupcake, or the filling will drip off. Squeeze the filling in the cupcake, moving the bag upwards until you reach the top of cupcake. Smooth the leftover leaking curd on top of cupcake with a spoon or spatula. Whip heavy cream for 5 minutes until stiff peaks. In a separate bowl whip cream cheese with lemon juice. Slowly fold in whipped cream into cream cheese until combined. To finally decorate the cupcake, draw around it drips of melting snow – use leftover icing for that. Then add white frosting on top and smooth it with offset spatula or spoon. Leave some snow drifts, don't make it super even. 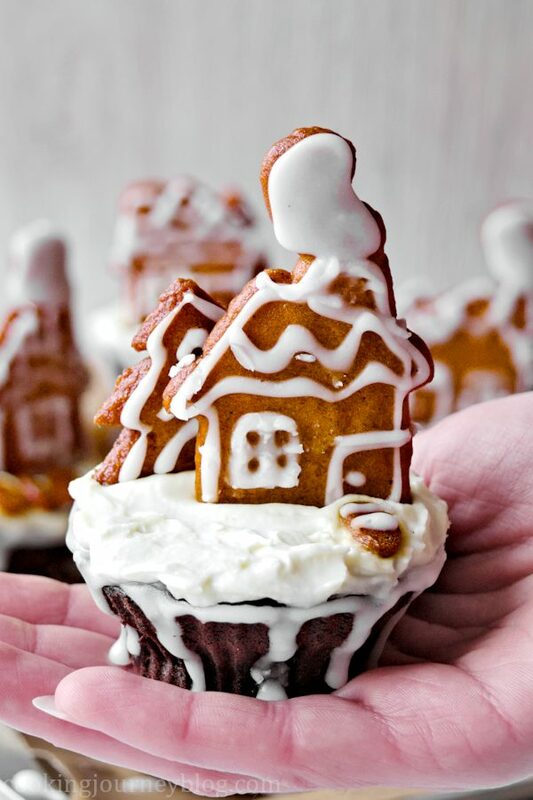 Insert a house and a Christmas tree in every cupcake, stick into frosting. Secure them with wooden toothpicks, cut in half. Add the roads and fences. *Don’t forget that you should fit one house AND one Christmas tree on the cupcake. So I suggest after cutting one house and one Christmas tree, lift them and try to fit on the cupcake mold to see if it fits. If it doesn’t, it is easy to cut more around the sides of the house and Christmas tree. Gingerbread is my favorite flavor this season! 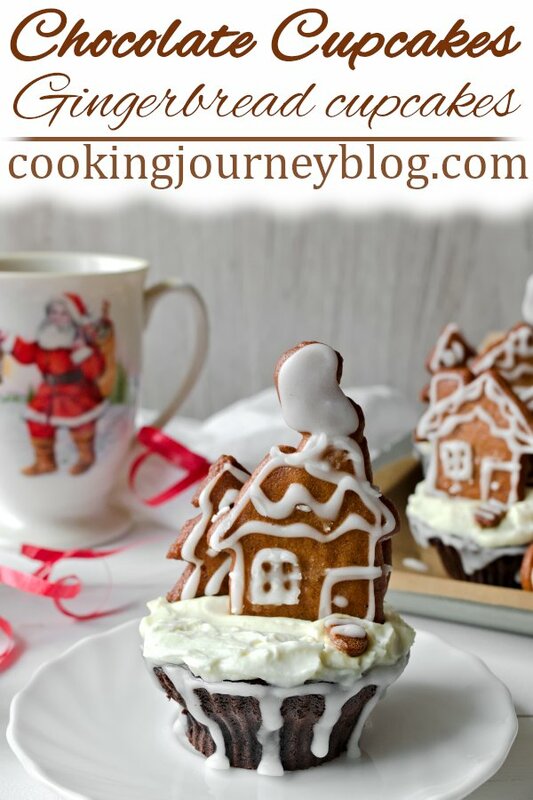 I LOVE those little houses on top of the cupcakes – so cute and festive! 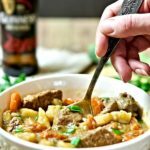 A perfect Christmas recipe! Gingerbread and chocolate are our two most favorite thing this season! So this is our ultimate Christmas cupcake recipe. Thank you for a lovely comment, Lauren. These are adorable and so perfect for the holiday season! That’s true! Merry merry chocolate cupcakes for Merry Merry Christmas, hoho! These are adorable and look delicious! Don’t think I have the patience to make a whole gingerbread house, but these cookie toppers are perfect! Yes, I also fell overwhelmed, when I see those huge gingerbread towns! So we created cute little houses on a chocolate cake that you can move as you like! 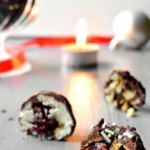 Yum, not only are these cute, they are perfect for the holiday season. The orange filling sound delicious. These make me happy and into the Christmas spirit!! The orange filling is our favorite part, and it’s so good on it’s own. 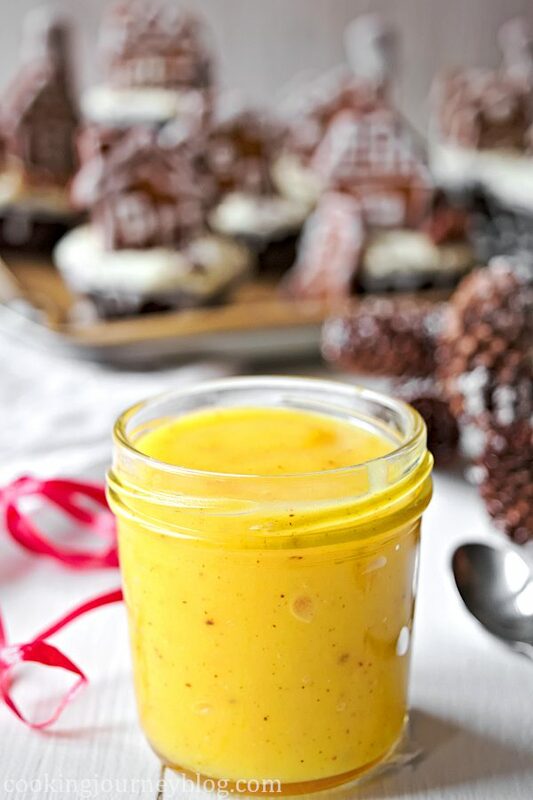 You can fill small jars with orange curd and wrap it as a gift! My goodness, these look adorable! 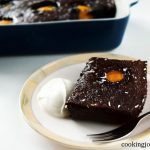 These look so cute with the gingerbread on top and I love the idea of the orange curd filling. Thank you, Lou! Orange + Chocolate + Gingerbread = Christmas! Merry Christmas!